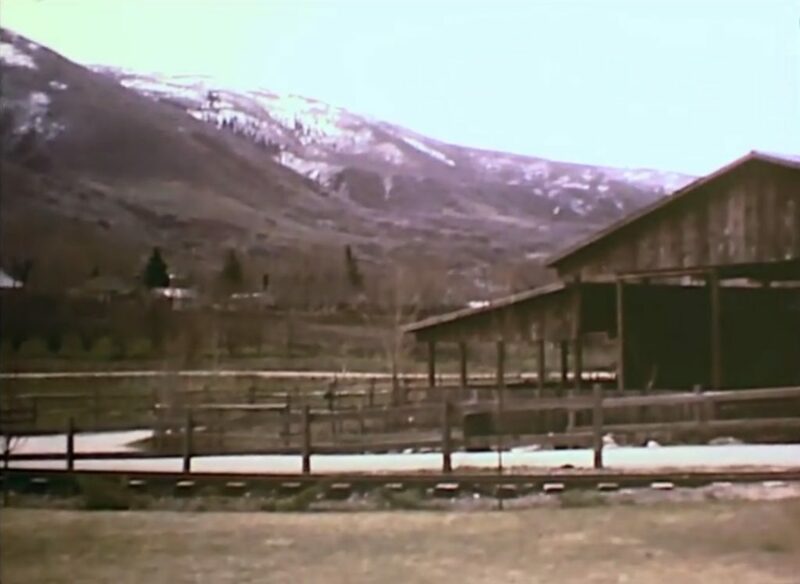 Pioneer Village began in the East Millcreek area of Salt Lake City in 1938. Furniture store owner Horace Sorenson collected pioneer-era buildings and artifacts as others were tearing them down or throwing them away. He opened his collection to the public and eventually turned it over to the Sons Of Utah Pioneers who operated it until the mid-1970s. 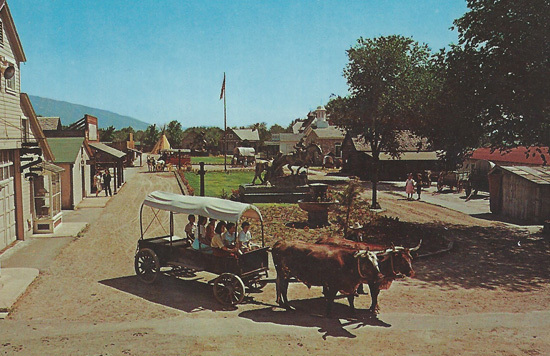 Postcard showing Pioneer Village in Salt Lake City. In its original location, Pioneer Village was out of the way of most tourist traffic and attendance dwindled. The S.U.P. was considering relocating when Lagoon showed interest in acquiring the collection. The S.U.P. favored Lagoon since they wanted to keep the collection together instead of being sold off individually and the two parties struck a deal. The sale helped fund a new headquarters for the S.U.P. Beginning in spring of 1975, the collection was carefully relocated to Farmington. It was forty years ago on Memorial Day, 31 May 1976 when Pioneer Village was dedicated at its new home by Spencer W. Kimball, president of the Church Of Jesus Christ Of Latter-Day Saints at the time. Since then much has changed and much has remained the same. Attractions have come and gone, display items have been rotated in and out of storage and trees have matured. Lagoon has also added to the collection and included a variety of attractions over the years. The Log Flume was purchased from a park in Oregon. It opened a year before Pioneer Village was completely relocated. When everything was finished in 1976, features added by Lagoon included an old-fashioned shooting gallery, ice cream shop and bakery. Lagoon’s original miniature train was fixed up after decades of being in storage to take kids around a track that circled the buildings on the north end of the village. When that ride had run its course, the loading area later became a fishing pond, but fishing only took place for a season or two (the pond is still there today). A larger train circled the entire village and used the old Kaysville Depot on the south end to load and unload. The Old Mill became famous for its barbecued corn on the cob. An old clock from Main Street in Salt Lake City was moved to the Village in 1977. A family-operated Stagecoach ride took guests along a path outside the Village where deer, bison and other animals could be seen. 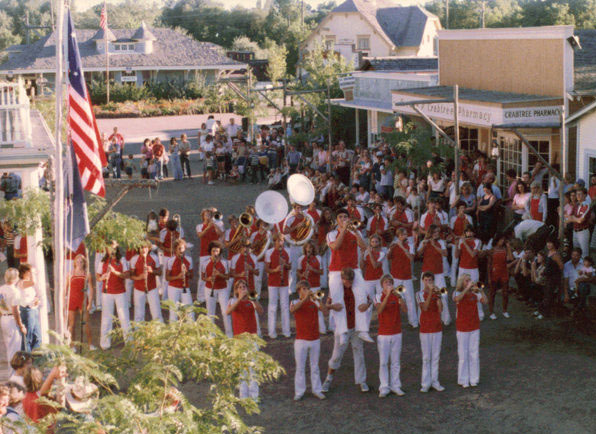 The shady Village Green featured concerts and other entertainment, but the most popular entertainment by far was right on Main Street where wild west shootouts were held regularly. A rare event was held in Pioneer Village in the early ’90s when it was opened to the public in November for a pioneer Christmas celebration. New museums and displays were added over time like Don Ogden’s Miniature Circus, the David E. Sperry Model Train Museum and the Coin, Silver & Currency Collection. 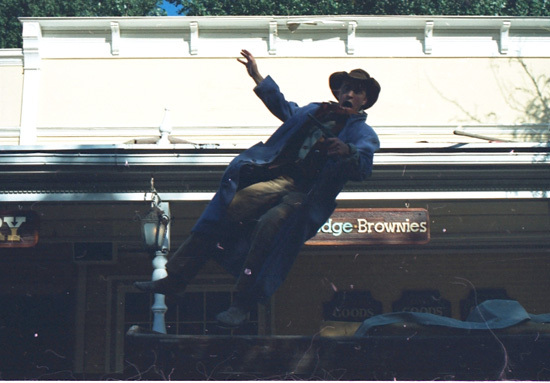 The biggest addition came in 1997 with the opening of Rattlesnake Rapids. 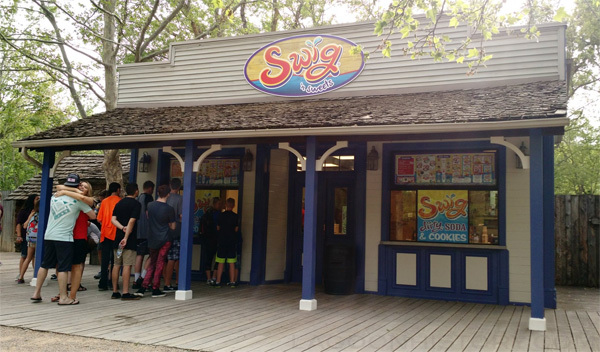 Over the past year, most of the buildings on Main Street have been repainted and just this month, the old Pony Express building found new life as a Swig ‘n Sweets location offering a variety of flavored drinks and cookies. 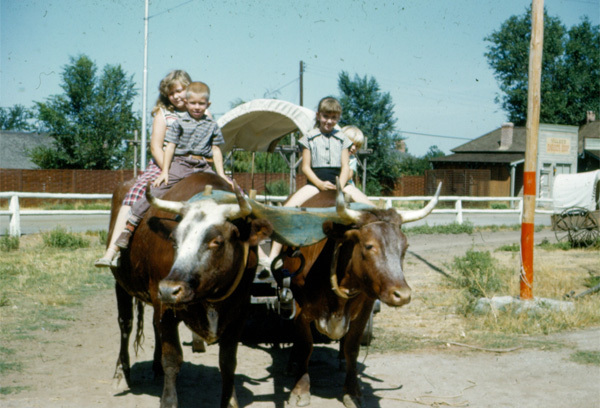 Today, Pioneer Village continues to provide a relaxing, quiet atmosphere away from the noise and modern thrills of the Midway where you can grab a treat and learn more about how life was before automobiles, interstates and shopping centers. The authentic buildings still provide a humbling insight into the lives of those who shaped the place Utahns call home.